February 14, 2014 - No Comments! 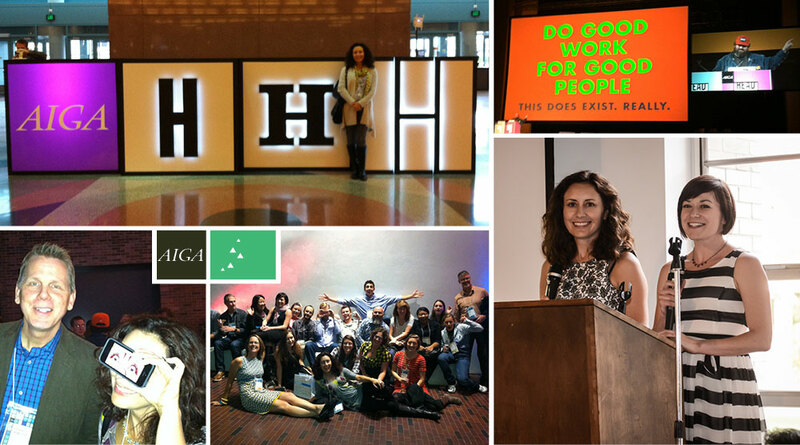 Last summer, I accepted the role of President for the Colorado Chapter of AIGA, the professional association for design. AIGA is a national organization with 25,000 members and 67 chapters. The AIGA is committed to advancing design as a professional craft, strategic advantage and vital cultural force. Founded in 1914, AIGA celebrates 100 years this year. The Denver Art Museum is keeper of the AIGA National Archives, a collection of more than 6,000 of the physical artifacts representing decades of the best in design and communication. Their new exhibit pulled from the Archives, Drawn to Action, is up throughout 2014. AIGA Colorado consists of 550 members and 2,500 friends. Each year, AIGA CO hosts 35 local events and initiatives relevant to designers and industry friends. Starting in May 2014 through June 2015, the chapter will celebrate 25 years serving the local design community. This volunteer position involves guiding a dynamic board of directors, along side President Emeritus Elysia Syriac, and representing the organization within the local community. My love of AIGA began in the mid 1990s when I served on the Board as Communications Chair, producing the quarterly newsletter. My membership has never lapsed and my involvement with AIGA has continued throughout my career via attending local speaker events and national conferences. When asked to take a leadership role, I viewed it as an opportunity to expand my knowledge of the myriad design disciplines that have arisen since founding EnZed Design 17 years ago. So much has changed since “print” was king. Teams of specialists now work seamlessly together to communicate within diverse media. Being part of AIGA helps me keep on top of trends and best practices. A true passion for design craft and design thinking—that together create strategic communications—is what really fires my caldron. AIGA offers an outlet for both. Read my post on AIGA CO’s website for more thoughts on why AIGA is still relevant to designers, after all these years. As President, I’m in a unique position to see the organization in a national scope. It’s been a privilege to get to know presidents from other chapters, national board members, and the national staff who are the wind beneath the sails of the organization. And it’s been a delight to get to know an enthusiastic local team of go-getters in the design industry making waves in the community. And it’s only just begun. I’ll be sharing more of AIGA Colorado’s plans for the coming two years of my term, including highlights from the National Leadership Conference hosted right here in Denver in May 2014. Stay tuned. Photos taken at the National Design Conference and at AIGA Colorado Gala (by Jason Hayes).